Did I do what I needed to do today to quit drinking alcohol? Did I do what I needed to do today to quit drinking? This is sort of an exercise in your own personal accountability. It’s a simple question you can ask yourself at the end of every day, and it’s fairly easy to come up with an answer. 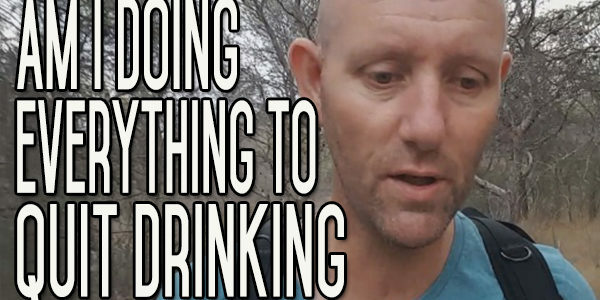 Did you do what you needed to do to quit drinking? And, if you didn’t, then there’s no point in looking for a solution anywhere else except in yourself. This is going to be the case for 99.9% of people. 999% of your efforts to quit if you haven’t quit on that day, and you ask yourself that one question and listen to the answers and what you have to say, examine what you did during the day, then I think most people would end up saying ‘No, I didn’t do what I needed to do to quit drinking’. The obvious one is: did you put any alcohol into your mouth? That is the first and really the only prerequisite. It’s the only sure-fire way that you know that you did everything you could to quit drinking. If at the end of the day, you didn’t drink any alcohol, regardless of your cravings, thoughts, excuses, how you felt, what kind of day you had, if you can answer that one question with: I didn’t put any alcohol into my mouth, then you did everything you could to quit drinking. If you did drink, it’s not the end of the world. If you get to the end of the day and ask this question and the answer is yes, then you can examine your day and see where you went wrong, see what happened in your life, in your emotions, see who you were with…you can go through these things and try and deduce what it was that tipped you over and brought you to taking a drink. once you don’t out the alcohol into your mouth, then you’ve quit. Once you put it in your mouth, you haven’t quit. But some people are just not ready physically, mentally to take the plunge. There are things in your life you might not have thought about. This is an automatic habit, something that happens in response to a trigger. There’s the trigger, the behaviour and the reward. It’s the thing that you get from drinking the alcohol. The sequence is almost automatic. There are so many different areas of your life where you can be triggered. So any aspects can trigger the behaviour, the drinking. Get me to the pub’. And one I got it in my mind, here was very little that could stop me from doing it. But there was the sequence of events that happened, and it could be anything. It could be the weather, or someone saying something to you. It could be listening to the radio and hearing something that sparks your memory. I’m saying there are a lot of different areas that can trigger it and lead you to the pub. So, at the very least, if you get to the end of every day and ask yourself the question, and then start examining the day and if you did drink, examine what happened. At the very least you will learn something new about yourself. Put it down in your diary, write it down somewhere. Get it so that it doesn’t happen again. This is something you can avoid in the future. Once you know these things about yourself, once you know that these things are happening, you can deal with it and do something about it. If you don’t know, then it’s going to sneak up on you. The automatic behaviour can be put into action, and like any automatic behaviour you’re unaware of it until you do it. The more you get into this, the more you understand yourself, the easier it will be to deal with future behaviours. The easier it will be to forecast which types of behaviours will spark you off and to understand the spark when it happens, to be aware of the trigger. The awareness is a part of this process that you have to develop. You have to build the unconscious habit into your conscious awareness. Most of the time, the trigger happens and it’s the subconscious movement towards the behaviour and ultimately towards the end reward that matters. This is all that matters at the end of the day, what you’re trying to get at the end of the day. The reward is the ultimate aim. If you can fine-tune your awareness into popping up when the triggers are firing off, then there’s a lot more you can do about it. It becomes a lot easier to deal with. If you have drank today, then ask yourself that question at the end of the day: did I do what I needed to do today to quit drinking alcohol? Seriously think for 5 or 10 minutes, think where you went wrong, what it was that happened before you drink and make a mental note of it. Better write it down because sometimes you can forget these things. Whereas if you write it down, you can always refer to it. You start to build knowledge about your triggers. The main thing you can do is educate yourself about yourself. About your habits and behaviours. Simple one today. I hope you got something out of it. If you did, give us a thumbs up. Leave a comment. Come on over to the website and sign up for the newsletter. Until next time, stay safe and keep the alcohol out of your mouth and keep asking yourself that question: did I do what I needed to do today to quit drinking alcohol? Hi Kevin, I think I am increasingly confident I am no longer addicted to alcohol. Its a great feeling, I was very heavily addicted and could at one time not see how I could enjoy life yet alone a holiday without booze. I have no wish to ever drink again. I have been for want of a better description practicing or testing myself out against triggers. My nemesis was always a holiday in France. I have rehearsed the scenario of me cycling to a small village, leaning my bike up against a wall and then being honest with myself asking how strong is the desire to drink. I can now say the desire is as close to nil as I think I will ever get. Also I would feel sorry for people sat there drinking alcohol not envy. I can also see myself enjoying the French atmosphere and the warm sun with a glass of orange and really appreciating the surroundings. With no worry about feeling sluggish or tired later in the day. At one time I would test out places and people and avoid anything I thought might be a tipper. This may be useful to others not yet as far down the road as myself, to mentally rehearse the situation if say you are going to wedding or out for a curry if you feel in your mind your not ready for such a big or such multiple triggers don’t go. Then as you progress and your knowledge and understanding of alcohol addiction grows test yourself again. Thank you, Kevin for another excellent video. You have been such a big part in changing my life.